Bone resorption can be considered as a pitfall to achieve excellent results in oral rehabilitation with dental implants. Soon after a tooth extraction, a physiological bone remodeling starts and it lasts for about 16 to 24 weeks. This remodeling might result in a certain bone resorption that can jeopardize the final clinical outcome or compromise the implant placement in a prosthetically driven position. Many techniques and different materials have been used to augment the alveolar bone either simultaneously or before implant placement. The socket preservation techniques have become very popular in order to counteract the physiological bone resorption. In this case a primary closure is not attempted. In so doing this will leave the surgical site exposed to the oral cavity. A cell occlusive membrane can be used to avoid any contamination of the grafting material, most of the membranes utilized in these cases are resorbable. One of the main properties of these membranes is the fast resorption in case of exposure to the oral cavity, this will impede infection and bacterial contamination of the site. 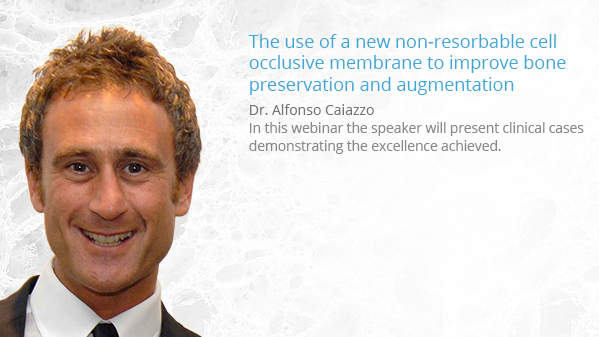 Recently a new non-resorbable membrane has been launched on the market, differently from the ePTFE membranes this new product will not be contaminated by pathogenic bacteria if exposed to the oral cavity. Because of this, the new membrane may be ideal for Socket Preservation and for a GBR technique in cases where the risk of membrane exposure is very high. Dr. Alfonso Caiazzo was awarded his dental degree at the University of Naples, Italy, in 1991. He went through a residency program in Oral and Maxillofacial surgery at TUFTS University in Boston, USA from 1993-1997. He was clinical instructor at the same University in the department of oral surgery in 1998. From 1997 to 1999 he did a fellowship in Implant dentistry at the New York University, New York USA. He is Visiting Assistant Professor of Oral & Maxillofacial Surgery in the Henry M. Goldman School of Dental Medicine (Boston University). He is member of the American Association of Oral and Maxillofacial Surgery. He is President Elect of the Italian society of oral surgery and implant dentistry (SICOI). He is Fellow of the European Federation of Oral Surgery Societies (EFOSS). He is founding member of the European Society of Dental & Craniofacial Stem Cells (ESDCSC). Co-editor of the book Orthodontically Driven Corticotomy , Wiley-Blackwell 2015. Co-author of the chapter Implant dentistry in Oral Surgery for the General Dentist, Wiley-Blackwell 2015. Author of several articles in International Journals. His office is located in Salerno, Italy, and his practice is limited to oral surgery and Implant dentistry.